Hi, I liked the shoes, however they should come with something more, I mean get some accessories like bags for what you have paid for. I'm a new league bowler and was having serious foot pain from my previous shoes mid way through the 1st game. I decided to invest in a pair of bowling shoes that would give me arch and heel support after 2 failed attempts of purchasing "cute" bowling shoes. I bowled for the first time in them and absolutely NO discomfort or pain. I'm still adjusting to the slide but over all I'm very pleased with my purchase. If you are unsure of your size I suggest going a 1/2 size down. I ordered a 7.5 and they were loose and I had over an inch of room in the toe. I had to send the shoes back because they looked to had been worn and asked for a 7 they fit perfect and feel great, giving me the support I needed! Does this shoe come in wide widths? Hello! Dexter is only offering the shoe in regular width at this time. Hello Jaz! Yes, this is a new shoe that Dexter has very recently released. Has this sole been upgraded from the previous SSTs to last longer for bowlers with toe drag? Hello Nita! 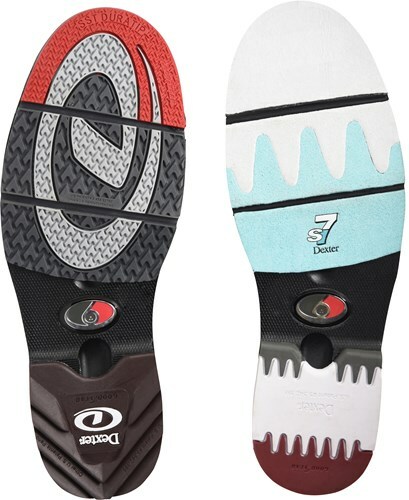 Yes, there is a new design on THE 9s than there was on the SST 8s that is supposed to help the sole stay together better for bowlers with toe drag. Is there any kind of ventilation so they won't be so hot? Great question, Nana! It looks like the tongue of the shoe is made of a little bit lighter material to help the shoe breathe a little bit. That looks to be about it though. Do you have replacement soles for these to give me more slide? I love the shoes but stops my foot too quick. Hello Diana! 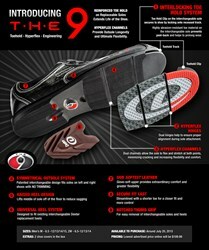 Yes, we do have THE 9 soles available on our site in the Dexter and Shoe Accessory categories. For slide soles in particular, the shoe came with a slide 7, and the higher the number, the more slide you'll get. The description says convertible right to left, do they come with the slide do convert or do lefties have to purchase extra slides? Hello Tracy! No, lefties won't have to buy the slide soles. If the shoe comes set up for a right handed bowler, you can just switch the soles and heels to the opposite shoes. On the slide sole, I have a number of Dexter SST soles. Will those slide soles work on THE 9 slide sole? Hello Mike! No, the SST slide soles will not work for THE 9. 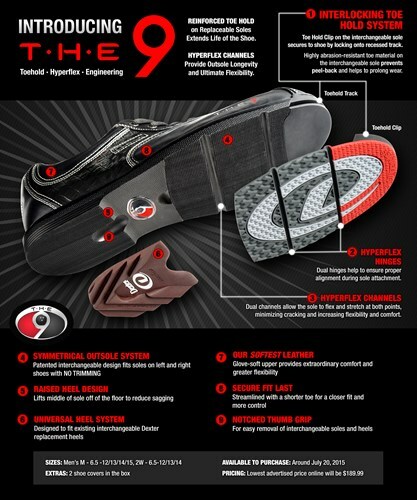 That shoe has a brand new design and THE 9 soles are made specifically for that shoe. Where on this website can I see and order the soles I want, since the heels and soles that come with it aren't what I need? The SST8 material is hard. Is The 9 a softer material? Hello! The material is going to be similar. Hi Linda. The size you will need to order would be the extra small size. does this shoe come in 8-12 narrow? Hello. Yes, we offer those sizes. The women's regular width will be a B width. Unfortunately, we do not carry narrow widths. Hello! On this style shoe, the white and silver crocodile is the only color available at this time. Hello. You would have to order that separately for it does not come with a S10 slide. I need a size 4 in either this shoes or one similar. I want the shoes to have the interchangeable soles. Is that available? Unfortunately, almost all of our shoes that are a size 4 will be a childrens shoe. Due to the time it takes to produce the Dexter Womens THE 9 White/Silver Crocodile Right Hand or Left Hand ball it will ship in 2 bus. days. We cannot ship this ball outside the United States.